Celebrate Science 2013 Make It Fun! Are you a parent, teacher, writer, or a librarians who wants to engage youth in science and math? Here’s your chance to learn about books, a few simple hands-on activities, scientific collections and quests—designed to help you make science and math fun! Dr. Trites’ research on pinnipeds (Steller sea lions, northern fur seals, and harbor seals) is designed to further the conservation and understanding of marine mammals. In 2007 as part of the Big Blue Project team, he unearthed a blue whale skeleton in PEI. This experience plus his driving passion to resolve conflicts between people and marine mammals are compelling. “I don’t know what questions will raise their heads tomorrow, that’s partly what makes this so interesting”. Find out more about this awesome scientist. Claire Eamer , author The World in Your Lunch Box, Lizards in the Sky, Spiked Scorpions & Walking Whales and more; Shar Levine and Leslie Johnstone, hands-on science writers with over 70 science books including the Dirt Book, Kitchen Science, and Hockey Science; Carol McDougall, creator of Salmon Sky View; Lori Sherritt-Fleming, artist, aRYTHMetic poet; Ashley Spires, illustrator of Scary Science and Blinky the Space Cat books and E.Paul Zehr, writer of books using superheroes to improve scientific literacy, Becoming Batman & Inventing Iron Man. Special Tribute to science educator, Gordon Gore and founder of the Big Little Science Center in Kamloops. Go on a guided tour of the Beaty Biodiversity Museum and learn about their fascinating collections and exciting programs. Did we mention the best part? Thanks to the generosity of our sponsors this year’s event is FREE! Who could turn down a fun-filled morning featuring the skeleton of a blue whale? And now back to books, or in this case authors. One of my favorites was slated to speak at BEA, but since John Green’s wife is just about to give birth, he spoke via a video feed. John is passionate about books. He uses his speech as an opportunity to support the book industry and refute the “insidious lie” that authors don’t need anyone aside from readers. He does not consider himself to be an example of someone who is changing the publishing paradigm through the use of new media. Listen to what he has to say, and I’m sure you’ll agree that this is one awesome guy. And, if you haven’t read his books, get out to your local bookstore or library immediately and read read read! And for those of you who think that the industry (your publisher, your editor, your sales rep., your librarian, and your bookseller are “value-sucking middlemen; I feel sad for you! The School of Library, Archival and Information Studies is pleased to announce that Helene Høyrup, Ph.D., of the Royal School of Library and Information Science in Denmark, will be joining us as the inaugural Dodson Visiting Professor. She will be in the position from February to April 2013. Dr. Høyrup is Associate Professor in children’s literature and digital literacy at RSLIS n Copenhagen. She is an international scholar in children’s literature studies and has published extensively in the field. She is particularly interested in the theoretical development of children’s literature scholarship, the interface between children’s literature, art and literature for adults, and the situation of children’s literature and its studies in different nations and regions. Additionally, Dr. Høyrup is an international Hans Christian Andersen scholar and a partner in several Danish, Scandinavian and European research projects on children’s literature and canonicity, and on theories of informal learning with digital media. Wednesday, March 6th, 5:00 to 6:00 pm, Dodson Room, Room 302, Level 3, Chapman Learning Commons, Irving K. Barber Learning Centre, 1961 East Mall, University of British Columbia. It has been suggested that children’s literature is “an intersection of two powerful ideological positions: our ideas about childhood and our ideas about literature, ideas often conflicted beyond our knowing” (Lundin 2004: 147). 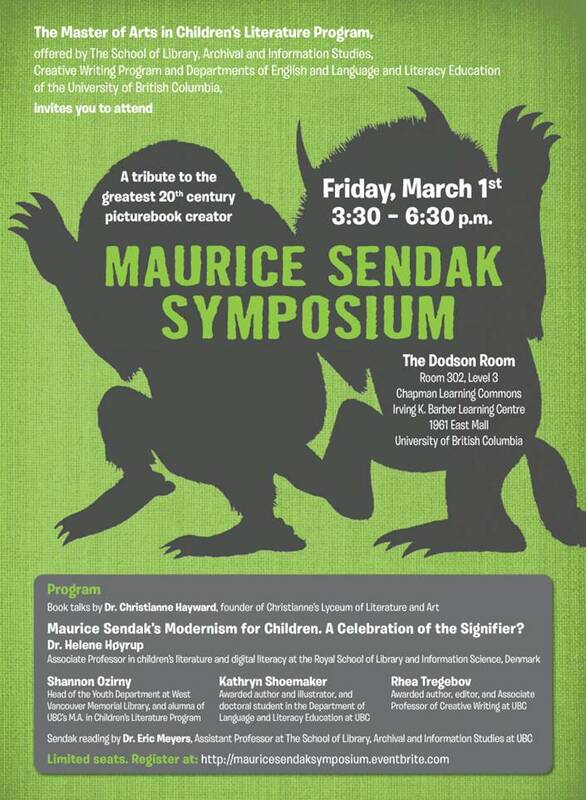 In this talk I shall give an outline of the contextual history of children’s literature in Denmark. In the lack of literary canonization (or, as German researchers phrase this process: decanonization) Danish children’s literature became a cultural battlefield reflecting different agents’ views of childhood and of literature. My talk will give an outline of this contextual history from Hans Christian Andersen’s fairy tales to the postmodern cross-generational aesthetics of today. Wednesday, March 20th, 12:00 to 1:00 pm, Lillooet Room, Room 301, Level 3, Chapman Learning Commons, Irving K. Barber Learning Centre, 1961 East Mall, University of British Columbia. How can the meeting between “old” and “new” media become a fruitful encounter? In the 20th century children’s literature research developed into a theoretically reflexive investigation of the relation between children, childhood and texts. It could be said to have undergone the linguistic “turn”, which has often been seen as a parallel to the emergence of digital media. Digital media, however, challenge the paradigm of print culture and the theories developed under previous media ecologies. The field of New Literacy has emerged as an interdisciplinary movement aiming at analyzing the processes and “texts” of the emerging digital knowledge system. New Literacy, from a Cultural Studies point of view, can be defined as socially recognized ways of creating, communicating and negotiating meaningful content, as mediated by texts and embedded in d/Discourses (Knobel & Lankshear). The mediation between media, text and user is here studied from primarily a socio-cultural perspective. This lecture is inspired by my research in the concept of knowledge media (with colleagues at RSLIS) and by the current planning of a research network on advanced literacy skills and textual competences in the new media age with participation from researchers in children’s literature and literacy from Sweden, England, Germany and Denmark. The lecture will also connect its theoretical points to trends in the development of library services for children and young adults in Denmark (e.g. based on the governmental committee work “Fremtidens biblioteksbetjening af børn” [Future Library Services for Children], in which Helene was a research member). 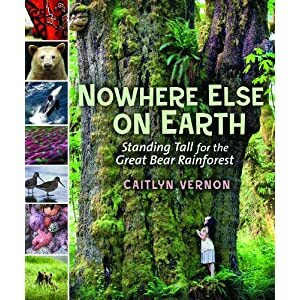 Debut author Caitlyn Vernon, winner of the 2012 Bolen Books Children’s Book Prize, will tell us about her uplifting ecology book, Nowhere Else on Earth: Standing Tall for the Great Bear Rainforest, and how she got started as a writer. Caitlyn Vernon grew up on British Columbia’s Pacific Coast and now calls Victoria home. She will never be too big to wade in the ocean in her gumboots, poke around in tide pools, explore coastal forests or climb trees and mountains. Caitlyn has a background in biology and environmental studies and is currently a campaigner with Sierra Club BC, working to protect the Great Bear Rainforest. Nowhere Else on Earth is her first book. The VCLR is open to the public. Members free, drop-ins $5, students $4. Meetings are held at the Nellie McClung Branch Library, 3950 Cedar Hill Road. 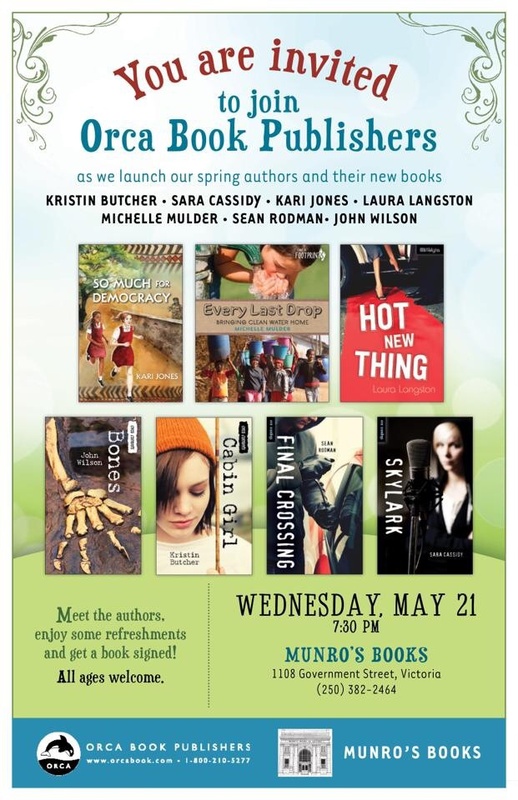 Come early and browse CanLit for Kids Books’ table, and bring a friend! Doors open at 7 pm. 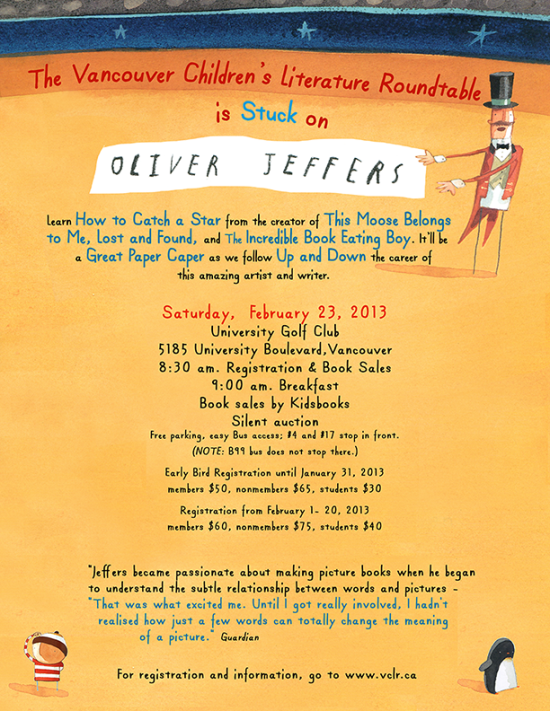 Vancouver has some great events coming up for children’s literature enthusiasts. Here are two that you won’t want to miss. Click on each image to enlarge for details.